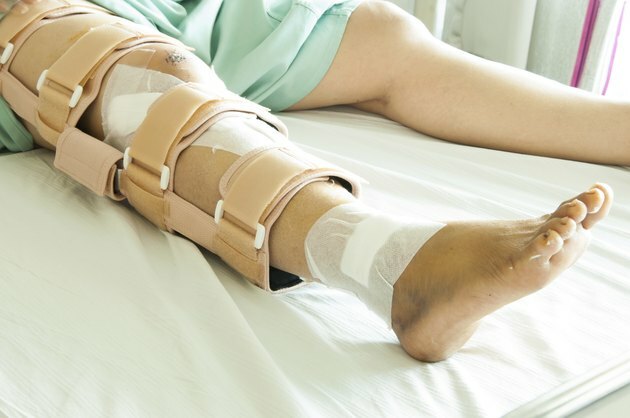 A broken leg will cause you to have to take a long break from training -- you will likely be in a cast for 12 to 16 weeks and have to perform specialist light physical therapy exercises for some time after the cast comes off. During this period, it is likely that you'll lose a lot of strength in both legs, especially the broken one. However, with the right training program, dedication and patience, and by working closely with your doctors and physical therapists, you can build muscle and get the leg bigger and stronger than before. Begin your rehabilitation program with seated isolation exercises. These include leg extensions and leg curls. They don't apply pressure directly through your leg bones, but do help the muscles get stronger. If you have access to a gym, use machines for these. If not, purchase some light resistance bands, and perform the exercises while sitting in a chair at home. Do each leg individually at first, so that you can concentrate on building strength in the injured leg. Perform five sets of 12 repetitions three times a week. Place a focus on standing stability next. After a long period of inactivity, you will have temporarily lost many of the basic functions of your leg, and may even have trouble placing any weight on it. Once you're comfortable with standing up and placing weight evenly on both legs, stand on just the injured leg for as long as you can. Once you can do this for 30 seconds, make it slightly tougher by dipping your knees a few inches or standing on an uneven surface. Aim to practice these balances for five minutes every day. Introduce regular weight exercises when you're comfortable placing weight on the leg. Weight training actually helps to strengthen your bones, which will reduce your risk of re-injury. Try some squats with just your body weight. Once you can perform three sets of 10, add weight with an empty Olympic barbell, or a light set of dumbbells. Introduce more complex leg exercises when you feel you're ready. Weighted single-leg exercises like split squats and lunges, along with posterior chain movements like dead lifts and kettlebell swings, help build leg muscle. But they are the most complicated and demanding types of exercise, so introduce them last. Start gradually with these, and only add weight when you feel confident that you're able to with risk of further injury. When you get to this stage, train your legs twice per week, with each session covering three or four exercises. Do three to five sets of eight to 15 repetitions for each exercise. Make sure you keep close contact with your doctors and physiotherapists to ensure that you're making good progress and not doing anything that could hurt your recovery.